Your ice machine and every individual part of it — including the condenser unit — needs to be dependable, efficient, and durable in order to keep your foodservice establishment running smoothly and successfully. For over 50 years, ICE-O-Matic has been working on developing new technologies for its products, and has grown into one of the top leaders in the entire ice making industry. 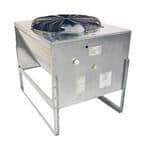 Ckitchen.com is proud to offer a broad line of Ice-O-Matic products, including ICE-O-Matic remote condenser units, for optimal performance and unbeatable prices. All ICE-O-Matic products are built to be reliable and efficient, and designed to be easy to use and maintain. They are found in all types of foodservice establishments, even schools and hospitals. Every Ice-O-Matic remote condenser units is coated with a unique sea salt corrosion protection. Sea salt corrosion protection is especially important for those operating a business along the coast line. However, the protection is important for all locations and establishments because it greatly reduces additional maintenance and service costs. It also means that this important piece of equipment will be long lasting and reliable as the years go by. 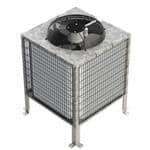 In comparison to other types of condenser units, remote condensers are great pieces of equipment to own because they reduce the cost of indoor air conditioning since they push the heat out and away from the kitchen. They are also extremely quiet. Remote condensers can be located up to about 50 feet away from your ice machine — even on the roof! Products we offer include the ICE-O-MaticRCA-1001 Remote Condenser, the ICE-O-MaticRGA-1061-HM Remote condenser, and many more. No matter your specific needs, volume, budget, or space requirements, CKitchen can help you find the perfect ice machine and remote condenser unit for your establishment. Purchasing a ICE-O-Matic Remote Condenser Unit is a decision you certainly won’t regret. Our top priority here at CKitchen is to provide each of our customers with the best possible customer service, as well as high performing, dependable products. 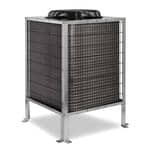 We are absolutely certain that you will be more than satisfied with any of the remote condenser units here. Shop our selection of ICE-O-Matic Remote Condenser Units for reliable and convenient products, the guaranteed lowest prices, and fast shipping. If you need any help at all choosing the right remote condenser unit, feel free to give us a call and our certified foodservice equipment consultants will be happy to assist you.